Happy Hispanic Heritage Month! I hope you’re spending some of your time from Sept. 15-Oct.15 curled up with a good YA book by a Latino/a author. If you need book suggestions, you may also want to check out Latina Book Club, Vamos a Leer, and The Hispanic Reader. Today’s YA author in the spotlight is: Benjamin Alire Sáenz. Enjoy! Benjamin Alire Sáenz was born in 1954 in Old Picacho, a small farming village outside of Las Cruces, New Mexico, less than 50 miles north of the U.S./Mexico border. He was the fourth of seven children and was raised on a small farm near Mesilla Park in a traditional Mexican-American Catholic family. During his youth, he worked at various jobs–painting apartments, picking onions, and cleaning for a janitorial service. After graduating from high school in 1972, he entered the seminary. He was later ordained a Catholic priest, but left the priesthood three and a half years later. At the age of 30, he entered the University of Texas at El Paso. He later received a fellowship at the University of Iowa. In 1988, he received a Wallace E. Stegner Fellowship in poetry from Stanford University. In 1993, he returned to the border to teach in the bilingual MFA program at UTEP. His other YA novels are: HE NEVER SAID GOODBYE, LAST NIGHT I SANG TO THE MONSTER, and ARISTOTLE AND DANTE DISCOVER THE SECRETS OF THE UNIVERSE. MY TWO CENTS: I listened to the audio version of this novel. I had mixed feelings while reading it, but the characters and story have stuck with me. Sáenz creates strong characters–main and supporting–that I cared about and could visualize. Sammy’s voice was spot-on as a teen boy who grapples with the personal issues all teens do–friends, love, fears and hopes for the future–while also dealing with poverty, racism, and the Vietnam War era. A pet peeve of mine is when authors describe in too much detail. Sáenz does this, but it didn’t stop me from reading. Also, while Sammy and Juliana are in love, as the book blurb states, this is not a traditional love story. Something tragic happens shortly into the novel that ends the love affair. I won’t spoil it, but the relationship was short-lived, and Sammy spends the rest of the novel dealing with this loss and many others. If you’re looking for something light-hearted with a happy ending, this one’s not for you. There was no uplifting, triumphant moment for the main character. I wanted something good to happen to Sammy. Sáenz left me feeling what it’s like to get pounded by life, as Sammy was, which is also a point worth making. Some people take a beating every day and have to find the strength to keep marching forward. Sad but true. TEACHING TIPS: This book has many issues worth pursuing in the classroom: immigration, poverty, grief, drug-use, discrimination based on race and sexual preference. One thing I thought about while reading was how parts of this novel could easily be used by teachers in different ways. I say parts because I don’t believe every novel used in class needs to be read cover-to-cover. Also, a history teacher, let’s say, may want to zero in on certain aspects of a novel, but may not want to handle elements typically taught by an English teacher, like character development or symbolism. The thread about the Vietnam War could be pulled from the novel and used to complement non-fiction pieces in history classes. The character Pifas is drafted and students protest the war by wearing black arm bands and staging a sit-in in the school cafeteria. These were among the most memorable moments in the novel. The conversation between Sammy and Pifas about being drafted is emotionally gut-wrenching, and my heart sank when Gigi gets out of the car and falls to her knees in reaction to the news about Pifas’s death. 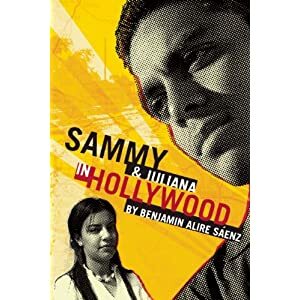 Find SAMMY & JULIANA IN HOLLYWOOD on Amazon.com, Barnes and Noble.com, IndieBound.org, and Goodreads. I loved this novel and, like you, find the characters are sticking with me long after I put the book down. All the powerful issues you name added to its realism for me. I think a lot of times editors and publishers push writers to pare down their themes and keep things focused and simple for their readers. But this results in fictional worlds that are curiously skewed and off-balance. Alire-Saenz’s novel is populated with enough characters to make it seem more like the real world of high school, with many kids who remind us of people we know and others who are unlike anyone we know. I have recommended this book too many times to count! Thanks for your comment, Rebecca. Yes, there’s a lot going on in the novel, but you’re right, it’s realistic in the sense that any group of people hanging out together has individual and collective concerns/issues.